This forest is schizophrenic...it is a forest with 2 distinct personalities. One part of it is decked up -- like the drawing room of an impoverished lord -- exhibiting all that attracts applause, and funds, from international agencies. The other part is the dark, dingy and miserable home for the majority of tribals who live here. That, really, is the story of the Harda forest division in Madhya Pradesh. The World Bank (WB) has recently sanctioned a loan of Rs 800 crores for forest development on the basis of the success of the joint forest management (JFM) experiment in this division of Hoshangabad district. But that's the "decked up drawing room". And, apart from a the fortunate few who live in the model villages, the tribals bear the brunt of the Madhya Pradesh Forest Department's (MPFD) tyranny. The foresters eagerly flaunt the JFM's success in the 52 forest villages constituting the Temagaon, Rahatgaon, Magardha and Makrai forest ranges of Timarni subdivision in Harda division. Jargon deflects cynical queries: "Janvikas (peoples development) is the key to vanvikas (forest development). So we concentrated on improving the agricultural infrastructure and providing alternative agrobased activities. Due to our interventions, the availability of water has increased, dependence on the moneylenders reduced, and denudation controlled," says A S Joshi, conservator, Hoshangabad Circle. K D Mehra, the divisional forest officer (DFO) of Harda adds, "Agricultural land being scarce, cultivation of vegetables, mushrooms and cashcrops are being promoted to maximise benefits." The FD also gives itself credits for the increased cultivation of commonlands, drawing up of a watershed development plan for the Gorakhal catchment area, and getting the people to undertake agroforestry on their farm bunds." Visitors are carefully conducted around and shown the prize Eco-development Centre at Rahatgaon and the model villages of Badwani and Khatmakhera. Badwani's 509-strong Korku tribal population has 141.025 ha of agricultural land and 70 ha of community wasteland, and much else to thank the Village Forest Protection Committee (VFPC) for: 3 stopdams and 2 World Food Programme-funded (WFP) lift-irrigation schemes; 2 community wells and 17 private wells, funded under the Jeevandhara scheme; 26 bullock carts and 8 engines and pumpset assemblies, provided under the Integrated Rural Development Programme (IRDP). The village has been remodelled and resettled with funds from the Indira Awaas Yojana. It now tidily sits on the 2 sides of a new street. Construction of contour bunds by the MPFD has increased the water level in wells. The villagers were taken to Ralegan Shindi in Maharashtra for training, and have since undertaken bund-making on their own land. There is a health centre (serviced twice a week by the Timarni primary health centre), and an ambulance bought with WFP funds. The samiti has accumulated Rs 1,10,000, freeing its members from the clutches of the moneylenders. They have bought a sprinkler irrigation system. Profitable activity Similarly, Khatmakhera, a village of 198 Gond tribals, have been persuaded to start the extremely profitable activity of mushroom cultivation. The FD supplies the inputs and handles the marketing as well. The women cook in improved chulhas (hearths) and a community hall has been built with WFP funds. Dehria village is, however, altogether a different world. No electricity; 70 km from the nearest health centre; inaccessible during the monsoons.... The occasional truck that carries felled timber is the only means of getting to this remotest of Harda's villages. For Mansingh, JFM means additional tasks of preventing forest fires and grazing. The 553 ha of forests here are constantly trespassed upon by people from the nearby Betul district. Baliram, a Korku tribal, says that the money earlier paid to them for firewatching and chowkidari (guarding) now goes into the samiti's coffers. 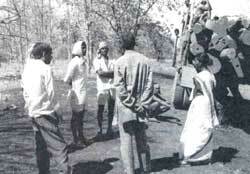 Instead, all the villagers, even women and children, are made to serve begaar (unpaid labour) in protecting the forest. "We were ordered to form a samiti (VFPC) and so we did. Ever since, we find it difficult to bring wood from the forest. We spy on and fight each other, while the forest guards watch the fun," Baliram agonises. Says Longesingh, the samiti's adhyaksha (president), "Two stopdams were built by the MPFD. One has filled up with gravel and the other is dry." Longesingh couldn't get funds sanctioned under the Jeevandhara scheme for digging a well, as the block development officer (BDO) refused to release the instalments on some pretext or other. "All the women have health problems. I have lost 6 children. But we are helpless, as it is almost impossible to go to Timarni for checkups," grieves Rajni, Longesingh's wife. The community has been cleverly divided by the authorities. Kisan, a Gavlan tribal from Gorahkhal, says, "The stopdams and lift irrigation schemes have benefitted onlythe adhyaksha and his friends. The rest of us have to migrate elsewhere for work. We cannot bring timber to repair our dilapidated houses. The MPFD takes away even the twigs from the trees they fell, leaving us only with the leaves." The women are irked. They not only don't have work, but even get no money for the mandatory firefighting. At Badwani, women complained that the new barrack-like settlements given them is within the deputy ranger's peeping range, compromising their privacy. Villagers lambast the block officials for refusing to work without bribes. Deputy ranger S Gaur admits of these difficulties, but adds, "The samiti funds have helped some people to avoid going to moneylenders." Deep in the jungle, people in Borpani complain that they have as yet no ownership deeds for the lands they have been inhabiting for the past 100 years. "All this samiti business is a farce. We should be given pattas (deeds) instead," said a villager. Chironjilal Uike, the Gond patel (village headman) alleges that 9 villagers had got their loans sanctioned only after ensuring that the gramsevak (assistant development extension officer) G R Sharma was richer by Rs 1,800. The warped development of the forests by the MPFD in these parts is the result of wrong motives. D S Sharma, the DFO in charge of felling activities -- euphemistically called production -- says that the annual yield of timber from the Harda division is about 21,000 cmt, of which 95 per cent is teak, valued at Rs 22 crores. In addition, 30,000 tonnes of bamboo feed the paper mills in Nepanagar, Khandwa district. 200,000 pieces of commercial bamboo too are harvested. Naturally, the woods are lovely, bright and deep -- too lucrative to be left untended. Says Rahul Benjamin, ranger, Magardha Range, "Once a bamboo forest flowers, it becomes a tinder box." Forest fires unless checked in time, jeopardise regeneration. Uncontrolled grazing, headloading and illegal felling were further affecting the sustainability of this gold mine. And hence arose the MPFD's sudden concern for janvikas. B M Rathore, a new ranger had to tackle the basic problem: persuading the lower forest staff to abandon the lathi (violent handling of the villagers). Reorientation exercises were held, uniforms were discarded, and the staff and the people together took part in participatory rural appraisal exercises. The WFP funds, hitherto used for forestry-related work, were now used to build water harvesting structures and start lift-irrigation schemes. The FD issued certificates of residence to the villagers, enabling them to get IRDP loans even without holding pattas. The fringe areas were inundated with funds. The villages in the interior, however, were not blessed with the same munificence. The samitis are run by the MPFD's fiat, with forest guards as secretaries. The male head of each family is a ostensibly a member, but few know about the samiti. One samiti does not know what the others are doing. There is no cross-village organisation. Some feel that this opacity of functioning has been carefully engineered by the MPFD to keep the people insecure and so, easily exploitable. Nothing had been done to improve their lot before the '90s. Since 1991, the whole effort has been geared towards ensuring the continued yield of revenue. Any development of the tribals that occurred was merely coincidental. Most tribals have been duped into giving more (through voluntary labour) than they have got back in developmental terms. The MPFD has not even informed the villagers that the government rules entitle them to 30 per cent of the produce of the forests they protect. P N Sarothia, ranger, Temagaon Range is defensive: "There was no finality in the government order specifying this. So it is better not to tell the villagers." Resentment abounds in the lower forest staff too. Officers have been awarded, while those who put in the actual work have been ignored. Even so, the forests get protected because of the low population and cattle pressures -- 34,610 people and 25,200 heads of cattle in an area of 143081 ha, with a cultivated area of only 2360 ha. The samitis function only because each has a forest guard as its secretary. The dissatisfaction in the staff and among the villagers, however, raises doubts about the long-term sustainability of the experiment. At the moment it is, however, a shining example of forest management, at least, for the eminent visitors. The latest such visitor was the state chief minister, Digvijay Singh. As is the norm, people were brought in truckloads to the public meeting in Badwani. But, says Kisan, "We were warned by the MPFD staff not to make any complaints." The chief minister, no doubt, has gone back to his luxurious Bhopal office, happy with the FD's marvellous achievements... and with the disciplined crowds! Meanwhile Mansingh of Dehria village patiently awaits an answer to his simple question: "We put out the fires in the forests. Who will put out the fires in our empty stomachs?"